Due to demand, sell out risk is VERY HIGH! Amber Necklaces For Mum And Baby are the perfect gift for Mum and natural teething alternative for Bub, both harnessing the health benefits of Amber. 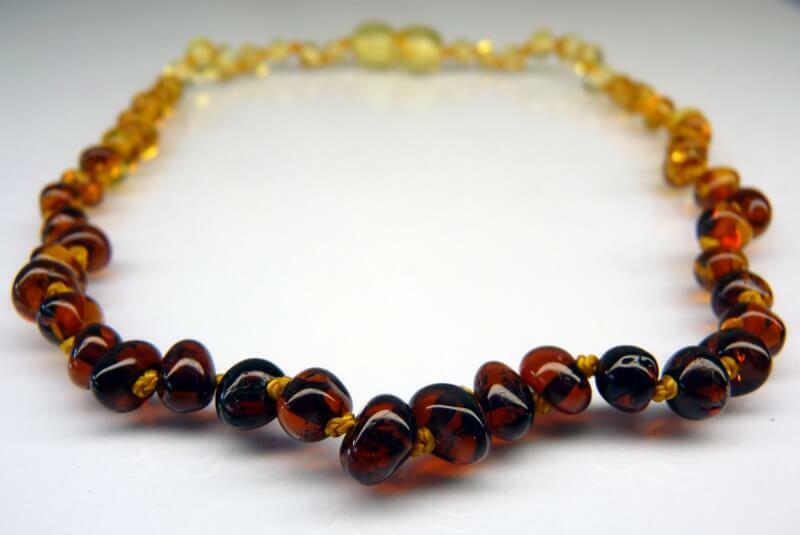 Featuring an Adult Amber Necklace and a Baby Teething Necklace in matching colors. 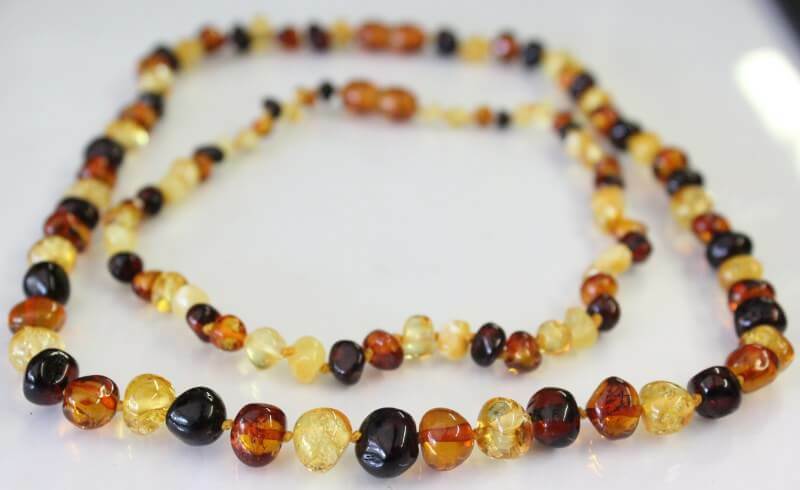 The Mum and Bub Amber combo is not only than a great amber necklace gift idea, it makes good sense for both mother & baby to benefit from the succinic acid in the amber, as it flows from mother to baby. The succinic oils is naturally absorbed through mums skin and into her system, where it would also pass through via breast milk to baby... giving a much better absorption rate of the amber oil for the baby. The beads are made from fossilised tree resin and have been used for centuries throughout Europe and parts of Asia to relieve the symptoms of teething as well as other pain and skin related conditions. When Amber is worn against the skin the heat from our skin releases the succinic acid from the Amber which then passes through our skin and into the bloodstream. 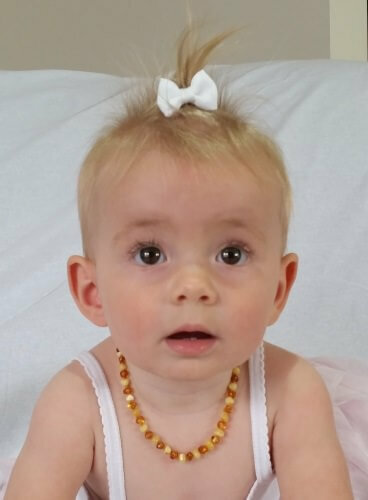 At The Baby Spot we only supply necklaces made from genuine Authentic Baltic Amber imported directly from manufacturers in Lithuania. Each and every one of Amber Necklaces comes with a Authenticity Certificate as supplied by our manufacturer. All of our Amber Necklaces include safety features like individually knotted beads, plastic screw clasps and are threaded on cotton threads. Thee adult necklaces have a highly polished finish and are 45cm in length, and the Baby Necklace are 32cm in length...and they come in four great colours, Bicolour, Multicolour, Natural White and White Cognac (plus more styles to be added soon). 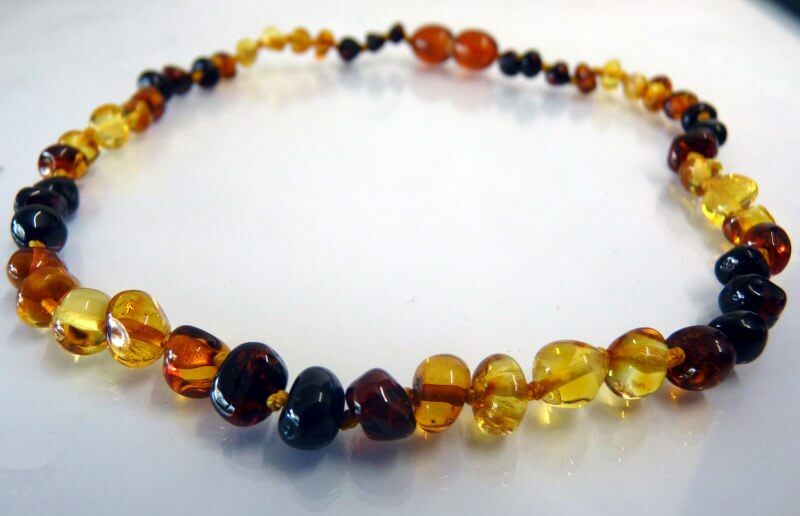 Baltic Amber Necklaces are rapidly growing in popularity as a natural alternative for baby teething and pain relief, which also means detractors, questioning the safety, so it is very important to check the safety features of the necklace. 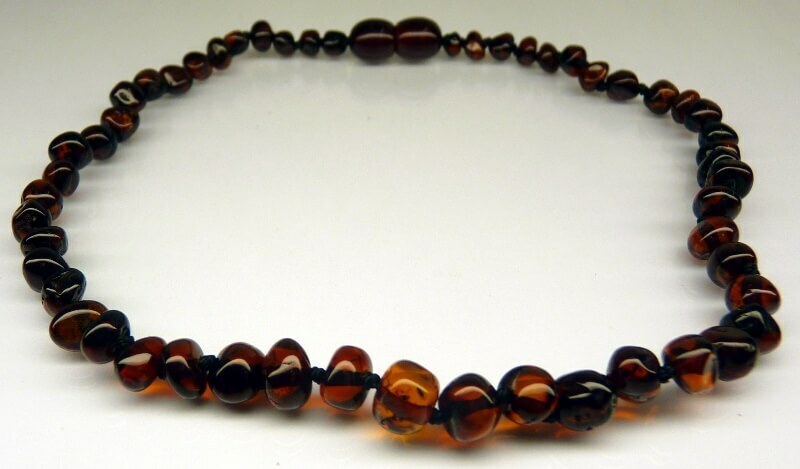 First, make sure every bead on the amber necklace is individually knotted (as per the picture above) so if the necklace was to break you would only ever loose one bead not all the beads on the necklace. If the necklace is not individually beaded, it should be avoided at all times. Secondly, the clasp should always be the plastic coded clasp, never metal or sterling silver. 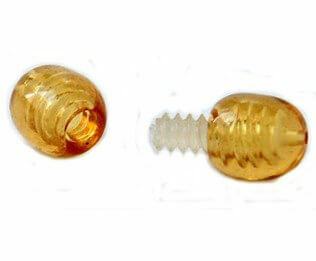 The plastic screw clasp is designed so that if enough pressure is applied to it the thread will pop and pull apart. Also, many babies have allergies to different types of metals. 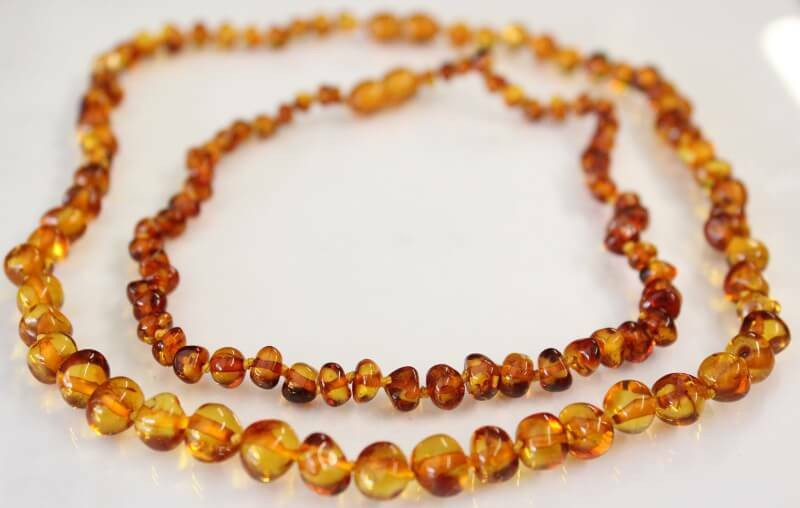 Thirdly, it is recommended that Amber Necklaces For Mum and Baby are threaded on cotton, not silk. Silk has a much higher breaking strain than cotton and it is important that the necklace is not to strong so that if baby does get caught on something either the clasp lets go or the thread breaks. 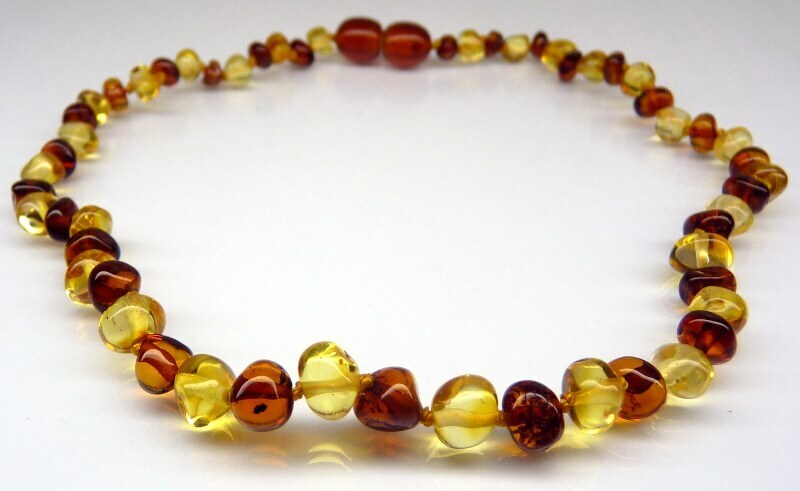 Amber Necklaces are also designed to be worn and not sucked or chewed on. It is strongly recommended that Teething Necklaces are worn under direct adult supervision at all times. As such the necklace should be short enough that your baby can not get any of the beads into his or her mouth. 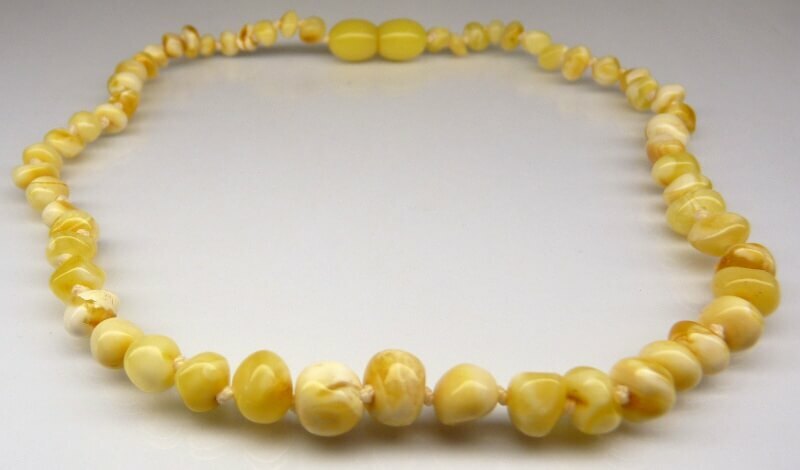 Authenticity certificates have become more important as Baltic Amber Necklaces gain more popularity. But knowing a fake Authenticity Certificate from a genuine certificate is not always easy. Authenticity Certificates should always come from the manufacturer and bear there stamp. 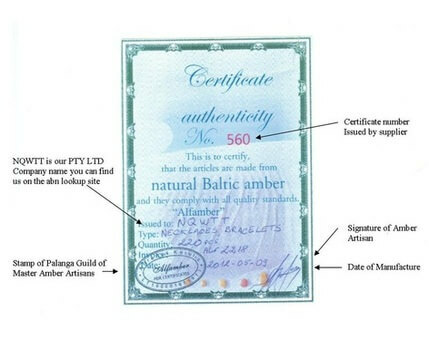 Our certificate is supplied by our manufacturer in Lithuania and they are current members of the Palanga Guild of Master Amber Artisans. It is important to be aware of fake and handwritten certificates. 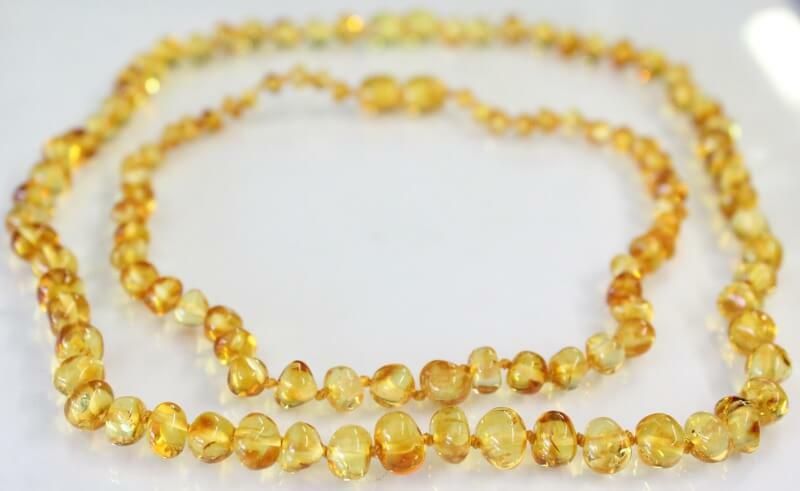 Here are some of the most common answers to the general question we receive about the Amber Teething Necklaces. What are amber teething necklaces? 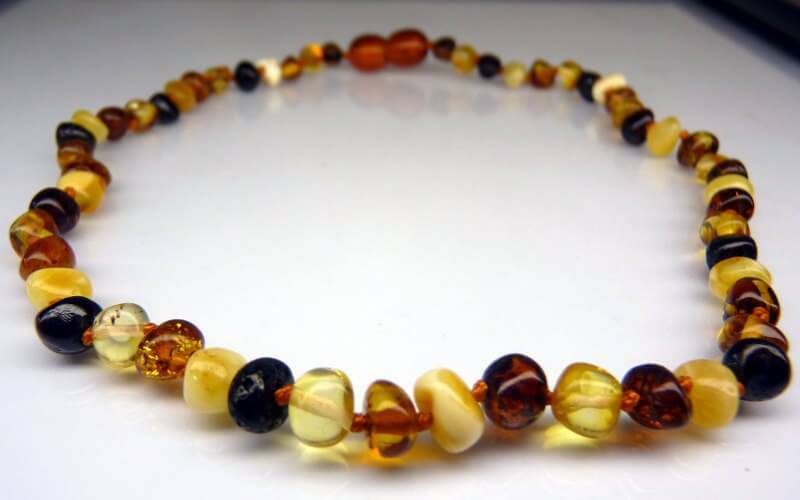 Amber teething necklaces are specifically design to safely relieve teething pains in babies. They feature amber beads that are secured on cotton thread with individual knots, and end in a specially designed safety clasps. 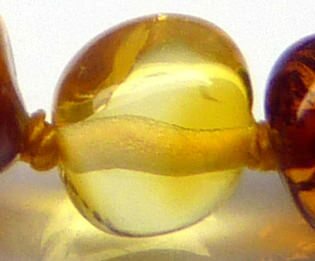 The amber beads come in different colors, from light honey color to dark cherry brown color, and also come in polished or unpolished (raw) beads. Are amber teething necklaces safe to sleep in? There are two thoughts when answering this question. The first, is that babies should not wear anything to bed. So that would include the amber necklace. Some parents do keep their necklaces on their babies all the time. It is a personal decision and you need to feel comfortable with your decision. Alternatively you can place the necklace on the babies ankle rather than around the neck, for safety reasons. Another option is the amber bracelet, which is worn on the ankle. Some mums also use a combination of both the necklace and the bracelet, and remove the necklace during sleep time. Which color amber teething necklace is best? The color of the necklace really is a personal preference, and each color style works exactly the same as each other necklace color. What length amber teething necklace is best? For babies, a 32cm necklace is the best size during teething while for the adults is in 45cm length. There is always the rare exception with a big baby. So we recommend you measure around your babies neck before ordering just to be sure. 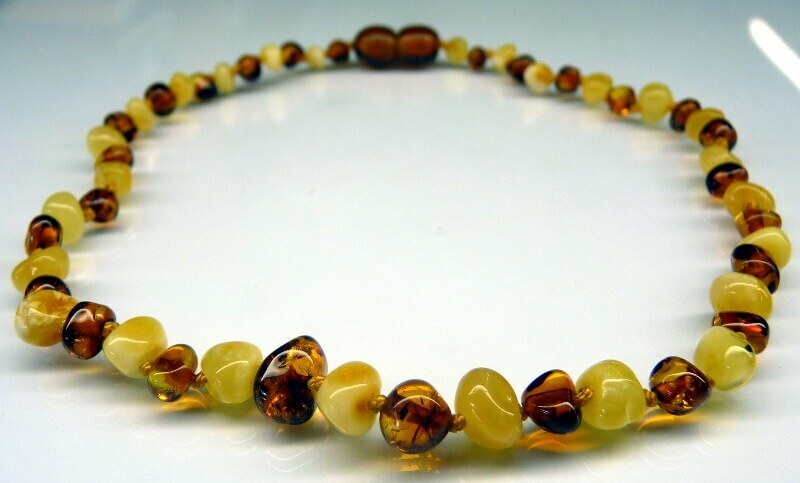 Amber teething necklaces are made of baltic amber (fossilized tree sap), which has been a traditional European remedy known for its healing and anti-inflammatory properties. Genuine Baltic Amber is sourced from Scandinavia or around the Baltic Sea, and should ideally come with a authenticity certificate. 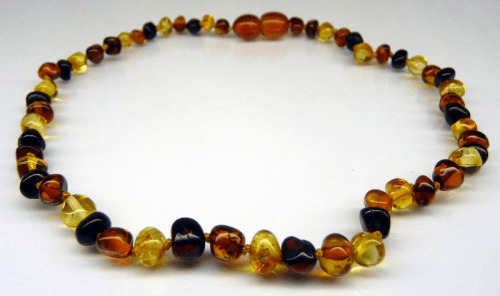 How should amber teething necklaces fit? 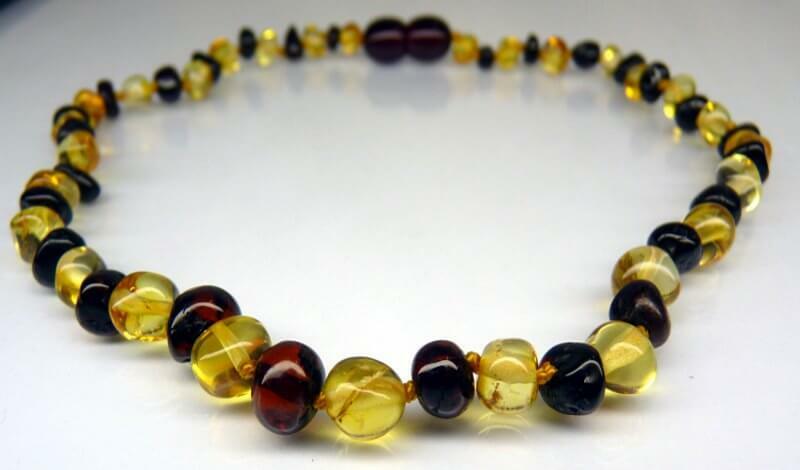 Amber teething necklaces, when done up, should sit comfortably in the nape of your babies and adults neck. It should not be to tight, or too loose so that the baby could get the necklace in their mouth.